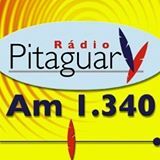 During a good Brazil-opening on November 6, 2013 (LEM333) Rádio Pitaguary was heard with a nice TOH id on 1340. Jari Ruohomäki (JPR) was the first one to catch this in October 2007 and the station has been logged every now and then since then. 1340 is not the easiest frequency for Brazilians. However, a few other stations have been logged during the past 10 years, such as CBN Porto Alegre RS and R Clube de Sâo Luis MA. In the 60’s and 70’s 1340 used to be the home of R Guaraní, Belo Horizonte, MG which in those days was one of the most common AM Brazilian stations. Guaraní nowadays resides on 1190 where it is a very rare catch. I received a FB message from Pitaguary.